1 of 1 In small bowl, stir together mayonnaise, ketchup, relish, sugar, dried onion and salt. Cover and refrigerate until ready to use. 1 of 4 In large bowl, mix together sirloin, Worcestershire, salt, pepper and garlic powder. Form into 6 hamburgers, about 3/4 inch thick. 2 of 4 In large skillet, cook bacon over medium-high heat until crisp, 6 to 8 minutes. Remove to paper toweling to drain; keep warm. 3 of 4 Prepare outdoor grill with hot coals or heat gas grill. (Or cook using oven method, below.) Grill burgers, uncovered, 4 minutes. Turn over; grill 3 minutes or until internal temperature registers 155 degrees F on instant-read thermometer. 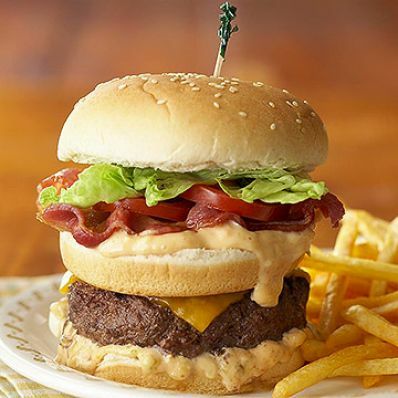 Place a slice of cheese on each burger. Grill, covered, 1 minute, until cheese melts. Remove burgers from grill; keep warm. 4 of 4 Toast the buns if you wish. 1 of 1 Reserve 6 bun tops. Spread each bun bottom with 1 tablespoon sauce. Place a burger on top of each of 6 bottoms. Top each with one of the remaining bun halves; spread each with 1 tablespoon sauce. Arrange 2 strips cooked bacon and 1 lettuce leaf on each. Top each with one of reserved bun tops. Serve with remaining sauce, and with French fries, if desired. Per Serving: 56 g pro., 42 g carb., 836 kcal cal., 1239 mg sodium, 2 g fiber, 16 g sat. fat, 49 g Fat, total, 167 mg chol.